This is a Bible lesson for preschoolers over Matthew 3:13-17, which is the passage where John baptizes Jesus. The main theme of this lesson is that we should Join Team Jesus – and that we show we are on Team Jesus by wearing His uniform through baptism. It’s a deep concept for little kids . . . but this lesson will help you introduce this concept in a fun, hands-on way. Enjoy! 1. Bring in a variety of different “team” uniforms. For example, you could have ball caps, several team jerseys, baseball pants, football helmets, etc. Let the kids have fun going through and trying on the different uniforms. Be sure to have a camera ready to capture the moments created during this activity! As they are trying on the uniforms, talk with the kids about what type of team each uniform represents. Ask: How can people tell you are on a certain team? One way is by the uniform that you wear! If I am on the Tigers’ Baseball team, I wear a Tigers’ uniform. I wouldn’t wear a Bears’ uniform on a Tigers’ team! Guess what? When we are on Jesus’ team, we want to make sure we wear HIS uniform! Jesus wants us on His team! 2. Play a game of “Follow the Leader”, only call the leader the “Captain”. Say: Today, we are going to pretend that you are on my team and I am your captain. You need to show that you are on my team by doing what I do! Are you ready? Lead the kids on a fun walk where they have to do everything that you are doing. Have fun with this – walk in crazy ways, and add all sorts of silly actions to your movements. If time permits, let some of the other kids take turns being the “Captain”. When you are finished, gather all the kids together and say: You did a great job being on my team! You tried to do exactly what I did – even when it seemed pretty silly! Jesus wants us to be on His team – and when we are on His team, we follow the captain. Who is the captain? JESUS! Jesus is our captain and, if we are on His team, we should do exactly what He wants us to do! Find a blue blanket or sheet and place it in your room to make a “river”. You can use two chairs to hold it up, pin it to the wall, or use two adults. You want to make it so the kids can stand behind it as if they are standing in the water. Also, find something to use as a “dove”. This can be a stuffed animal (bird) or even just a picture of a dove cut out of paper). Choose a child to pretend to be John the Baptist. Bring that child up in front of the class. Say: A long time ago, there was a man named John. John was telling people to say they were sorry for the bad things they had done and to follow God. He was also baptizing the people who wanted to do that. He would go with them into the river and then dunk them under the water. All the people who were being baptized were saying that they wanted to be on God’s team! Choose another child. Have that child come up to “John” in the river. Help “John” pretend to “Baptize” that person. (They can do this by standing behind the blanket, “John” puts his hand on the other person and that person ducks down under the blanket and then comes back up.) Give several other kids the chance to pretend to be baptized. Then choose one final child. As he is about to get into the “water” stop them and continue the story. One day, Jesus came to John at the river. Jesus asked John to baptize him! Did Jesus need to be baptized? NO! Remember, the people were saying they were sorry for all the bad things they had done, but Jesus had never done anything bad! Jesus had never done anything wrong! He didn’t need to say he was sorry! John knew that Jesus had never done anything wrong, and John didn’t want to baptize Jesus. He told Jesus that it should be the other way around – Jesus should be baptizing him! Have all the kids sit down. Say: So, why was Jesus baptized? Jesus knew that it was the right thing to do. He wanted to show everyone there, and all of us today, that if we want to be on Jesus’ team, we need to wear Jesus’ uniform – and that uniform starts with being baptized! This is how we show that we belong to Jesus! If we want to be on Team Jesus, we tell Jesus that we are sorry for all the bad things we have done, we ask Jesus to change us and help us not do those bad things anymore, and we put on His uniform by being baptized! This shows everyone that we are on Team Jesus! Baptism symbolizes the washing away of our sins. Use this fun activity to help preschoolers learn this concept. Beforehand, gather some dirt and water. Mix the dirt and water together until you have mud. Give each kid a paper plate. Say: When we do bad things, it is called sin. What are some sins that we might do? Let the kids say different things that are sins such as lying, stealing, disobeying, teasing, etc. Each time a kid mentions a “sin” give that kid a scoop of mud on his plate. Keep this up until every child has a plate full of mud. Let the kids play in the mud until their hands get really dirty. Then say: Oh my! Look at this mess! Your hands are filthy! All that sin made you very dirty, and if you aren’t careful, it could stain your clothes! We need to wash this all off! How can we do that? Get out a bucket of water, soap, and washcloths. Help the kids wash all the mud off their hands. As you are washing them, say: We need to wash this all off with this soap and water! Let’s wash it until you are all clean! When all the kids are cleaned up, say: When we do bad things, we get dirty on the inside. How do we get clean? When Jesus died on the cross and rose again, He made it possible for each one of us to get clean! When we ask Him to forgive us, He takes all the sin away and cleans us up! Baptism gives us a picture of Jesus washing us and making us clean! In Acts 2:38 it says that we should, “Repent and be baptized in the name of Jesus Christ for the forgiveness of your sins; and you will receive the gift of the Holy Spirit”. This is how you show that you are on Team Jesus! 2. Make a snack to represent this story. Give each child a graham cracker and blue frosting. Have them cover the graham cracker with the blue frosting. Then give them two crackers that can represent people (teddy grahams would work well for this). Have them put the “people” in the water. Let them use this craft to re-tell today’s story. Then let them eat the craft! 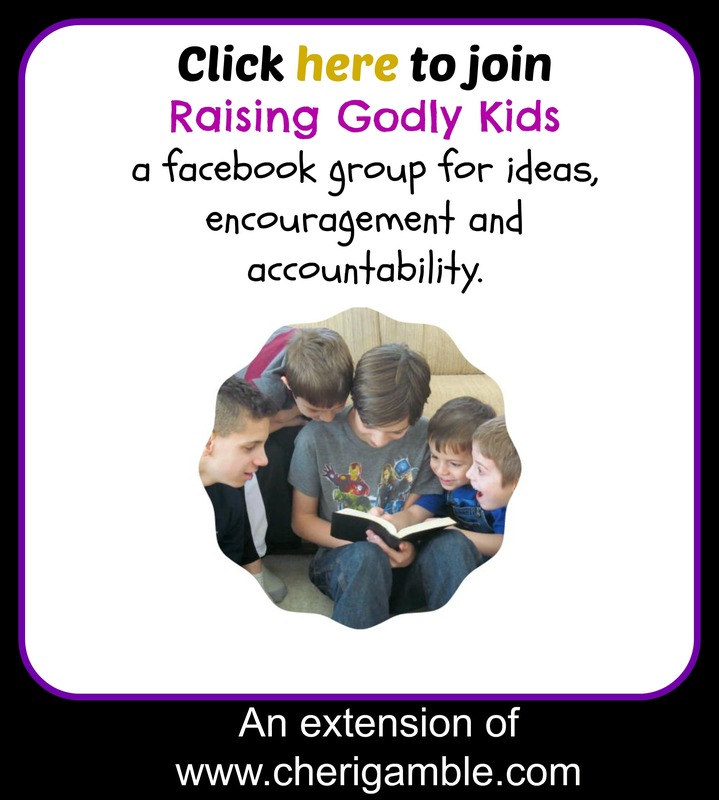 If you enjoy my Bible lessons, you might be interested in this 35 week study through the book of James for your family or church. We used this two years ago with all of our youth ministries – from preschool through high school. Maybe you can use it, too!